How Do We Find Our Voice? Many factors contribute to us not knowing our soul voice. Things like broken relationships, loss, abuse and shame can all been contributors. When we’ve lost our voice and our internal “true North”, we feel disoriented, disconnected and small. We feel afraid to be seen, because we’re not sure what other people are actually seeing – since who we are, can be lost on us. 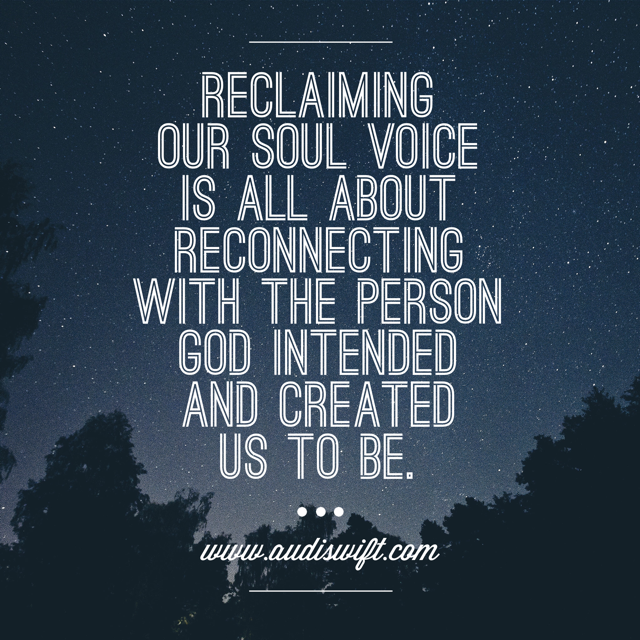 Reclaiming our soul voice is all about reconnecting with the person God intended and created us to be. It was never His intention for us to feel lost, afraid, disoriented, disconnected or small. In turn, it is His heart for us to feel loved, confident, worthy, secure, guided. The journey of reclaiming our soul voice is a deeper discovery as to how we grasp onto these truths with our own hands, how we believe them, deep in our soul, for ourself. The journey is long and sometimes difficult, and although we’d love to just arrive to a place of everlasting beauty, we remember that healing is a bit by bit process. To truly experience solid, lasting transformation, we must show up every single day and just keep putting one foot in front of the other. And that’s what we’re choosing to do. 1. Acknowledge the TRUTH about our pain from the past. We all have gnarly scars from our past. Not one of us escaped experiencing pain. I’m learning that true healing can’t occur until we’re ready to look at our pain in the face and call it what it is. We need to speak the truth about our pain and stop shoving it in the closet, believing it will just go away. If we’re experiencing shame, let’s call it shame. If we’re experiencing addiction, let’s call it addiction. If we’re experiencing depression, let’s call it depression. When we’re willing to call our pain for the truth of what it is, only then do we open our arms wide to true, lasting healing. 2. Pay attention to our thoughts and feelings (Without Judgement). It’s important we allow ourself to feel our true emotions and acknowledge them. Seems like a small thing, right? When we pay attention to our internal dialogue, we realize how difficult it can be to allow ourself the space to process what we need without trying to squeeze it into something more acceptable. A friend recently shared with me a “cheesy” little therapy strategy where you try to visualize and personify all of your emotions sitting around a single, long table in a board room. Anger pipes up and takes over the meeting in his tight collared shirt and suit, his slicked back hair, beady eyes, bulging neck and his fire-y red face. I look at him calmly. I tell him I see him and I hear him. I thank him for his service and then I kindly excuse him from the room. If there is anything to learn from Anger, I’m willing to take his complaints, and review and process them further. I’m learning that paying attention to my feelings sounds more like saying to myself, “I see you are feeling (blank) right now. It’s ok to feel (blank). When you are ready, let’s look at what might be causing your (blank).” Let’s stop judging our process and white-knuckling to get results. Our internal responses are telling us a story. 3. Connect with our childhood loves. No. I’m not suggesting you research and connect with old crushes from elementary school. In fact, it’s important to remember what made us feel alive when we were young. Even if our growing up years were painful… Can we remember what made us feel free, lovely and US? For me, this has meant embracing my tom-boyish side whom I forgot about for many, many years. The tom-boy part of me loves going running, watching ice hockey and shooting guns at a range. I feel empowered when I remember this part of me. At the same time, embracing the elegant side of me is just as important. I forgot that my absolute favorite color my whole life was sparkling, glittering GOLD. Remembering things we loved is an important step in reclaiming who God made us to be. Can you make a simple list that helps you remember? This can be a hard realization. When we’ve lost touch with our soul voice, a very common correlation is that we can tend to over-apologize for things or distrust our own decisions. For me, this had much to do with the fact I spent many years in an abusive relationship and acting on an eating disorder. I’ve realized that both actions were HUGE betrayals of myself. Even though the internal red flags were there, I didn’t listen to them. Not listening to our own soul causes us to feel shaky in our opinions and decisions. Each decision we make that lines up with who God created us to be – that rings true in our heart of hearts – slowly erases our past betrayals and builds self-trust. 5. Practice using our actual voice. Not exercising our honest thoughts and opinions can be a way of life for many of us who have lost touch with our soul voice. Fear of not being accepted, ruffling feathers or appearing imperfect covers up and silences our actual voice. We keep our opinions safe and tucked away, only making ourselves smaller and more invisible. We can intentionally practice finding ways to speak up, share our honest feelings and allow ourselves to be known by others. How will you make space for your soul voice this week? Which one of these practices seems the most challenging to you? < Previous What do we do with our Unprocessed Pain?